You can enter all of these giveaways through 11:59 pm EST tonight, Friday, July 30th and don't forget - you can vote for us on Top Baby Blogs once per day per IP address to earn extra entries too. I'll be announcing the winners on Monday so be sure to check back then and see if you were one of the lucky ones! Gabrielle and Alaina have recently turned into little book worms and I'm always asking friends which books their kids like so I can add some fun new titles to our collection. I figured some of you might be looking for new books too, so here are a few our current favorites. 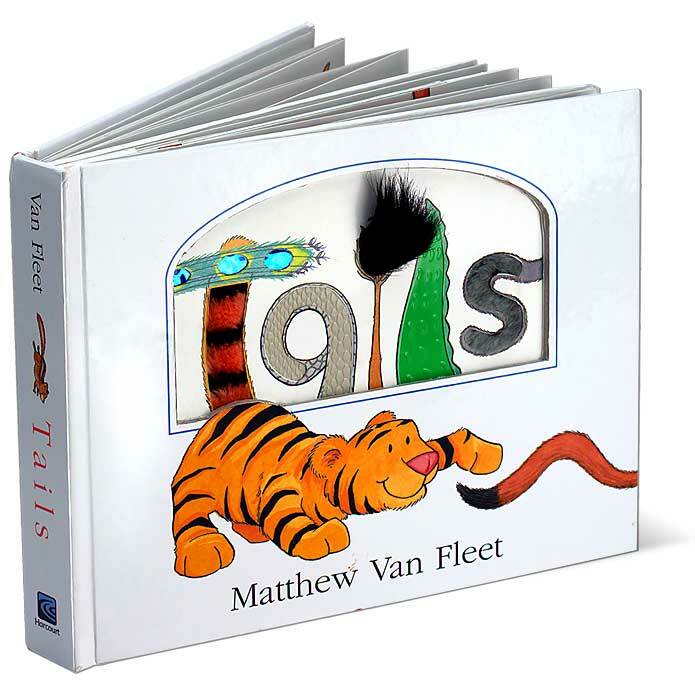 Gabrielle and Alaina love "touch" books, like Matthew Van Fleet's board books. Their current picks are Cats, which has lots of soft tails to stroke and other fun interactive pieces to pull and push. And Tails, which is very similar but also has scratch and sniff spots! 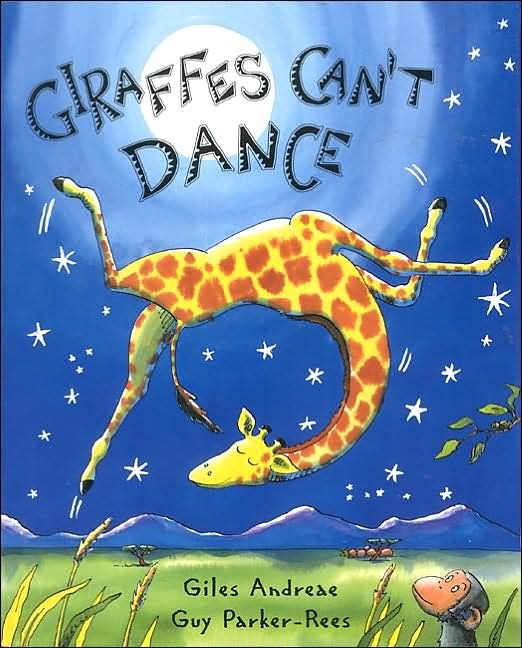 They're kind of stir crazy at this age but there are a few books they'll sit and listen to me read to them, like Giraffes Can't Dance by Gilles Andrae. 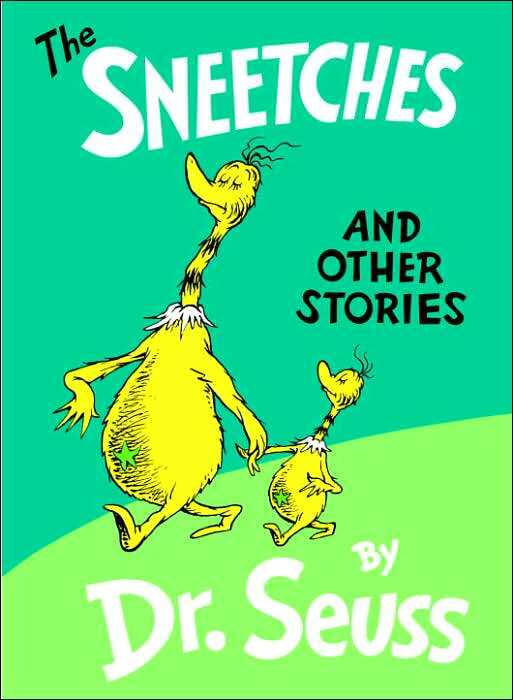 And The Sneetches by Dr. Seuss. The two newest additions to our repertoire are The Boy Who Wouldn't Share which is written by Mike Reiss, a former writer for The Simpsons. It's the story of Edward, who won't share his toys and ends up stuck in a pile of them after he tries to keep them all for himself. The illustrations are really entertaining and I like the message of the book a lot. And then there's Push Button by Aliki. My girls love to push any buttons they find, so this book about different buttons and the noises they make when you push them is perfect for them. I also love the bright illustrations - they really pop off the page. Check out some of these fun titles the next time you're at the library or the bookstore and I hope your little ones enjoy them as much as mine do! 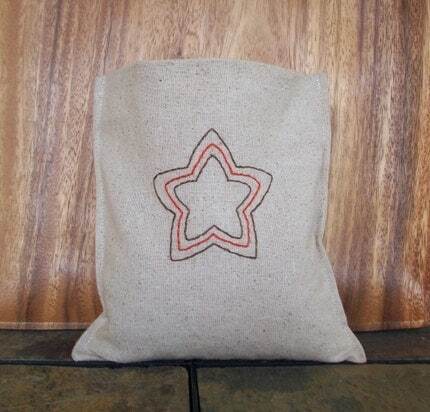 Blog about AFOMFT or this giveaway (worth 2 entries so please post two comments) and post a link to the post. Please leave a separate comment for each entry (two if you've blogged about the giveaway) and make sure to include a link to your tweet, blog post, etc. All entries must be posted on AFOMFT as a direct comment to this post. Comments on Facebook will not count as entries. This giveaway is open to residents of the U.S. and Canada and ends August 5th at 11:59 pm EST. The winner will be selected by random.org and announced on AFOMFT on August 6th. If the winner doesn't contact AFOMFT within 48 hours, a new drawing will be held so be sure to check back to see if you've won! Congratulations TRISTA! You've won this adorable set of Cherry Dot Bloomers from Three Yellow Starfish! 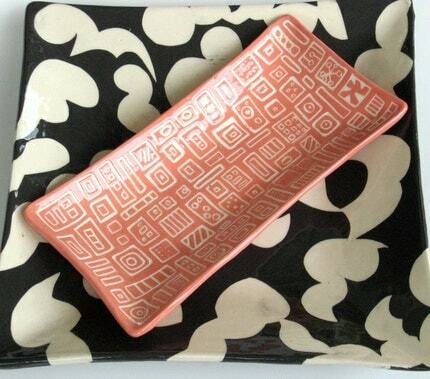 Please e-mail me at afomft@gmail.com by end of day Saturday, July 31st to claim your prize. If I do not hear from you by then, a new winner will be chosen. 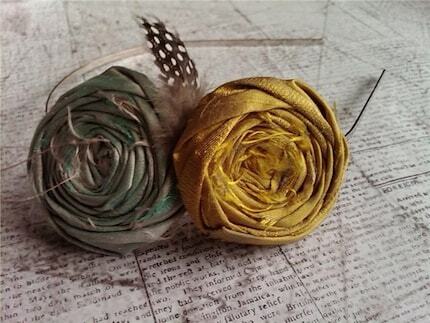 And a huge thank you to Three Yellow Starfish for this fabulous giveaway! When it comes to decor for Gabrielle and Alaina's room, I tend to like things that are bright and bold so when I was introduced to the delightful designs from Giraffes & Stuff, I wanted one of everything in the shop! 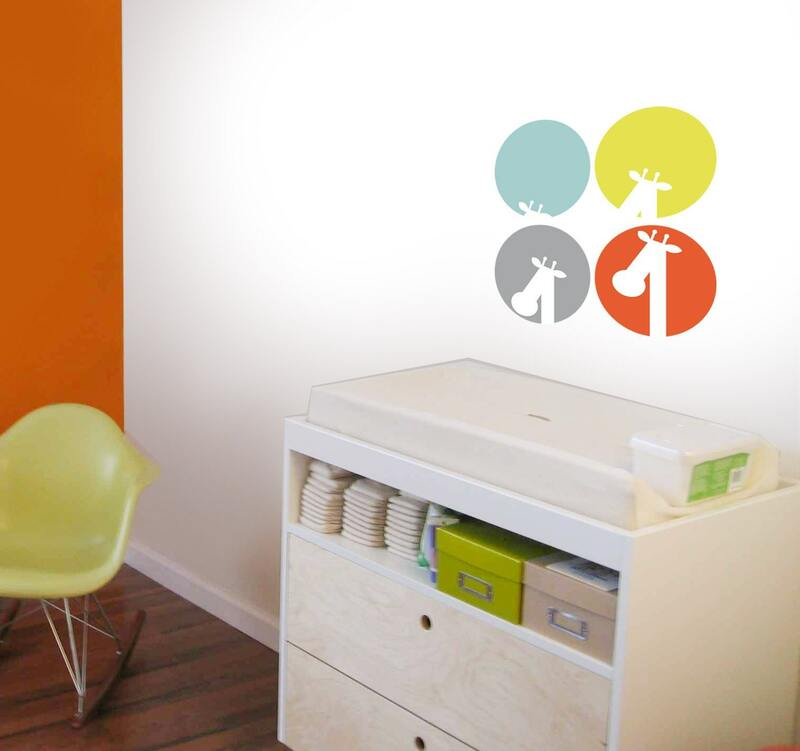 Yulia, the store owner, combines bold graphics with great colors to create fun and funky nursery decor. 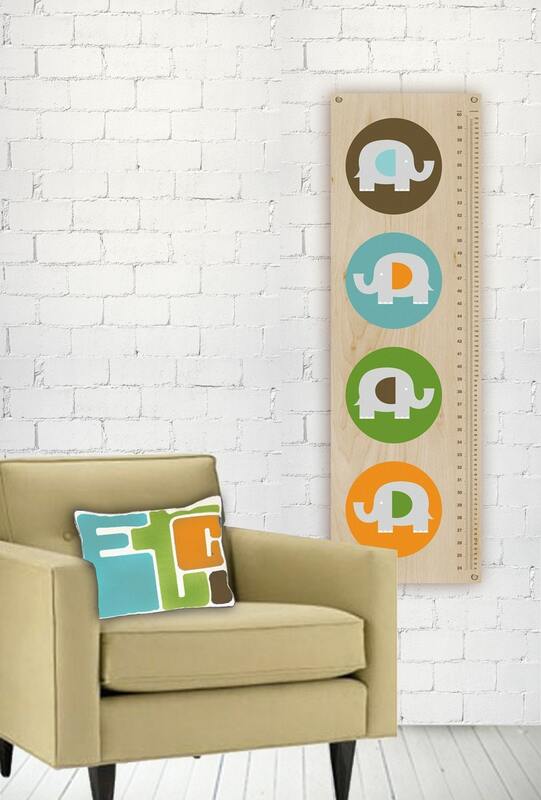 How great is this eleFUNt growth chart? I love the wood grain background! And what little guy won't want the Taxi Please version? 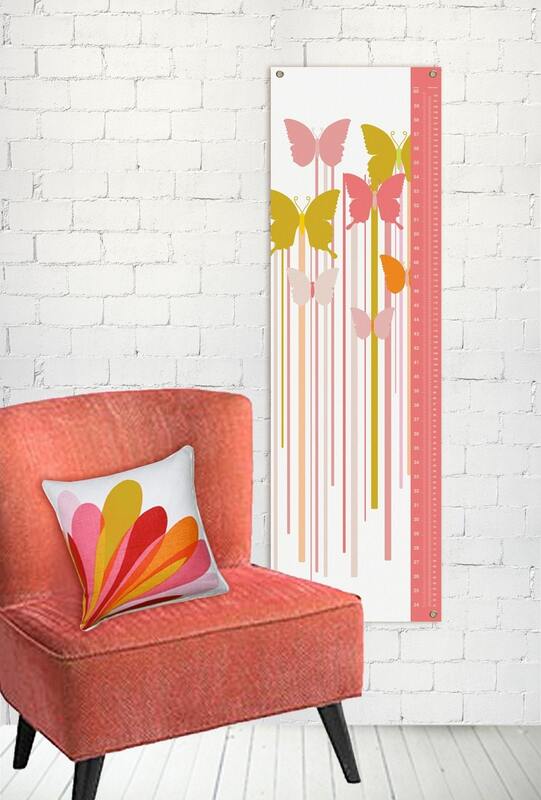 The Butterflies Be Free Growth Chart would go perfectly in Gabrielle and Alaina's room. 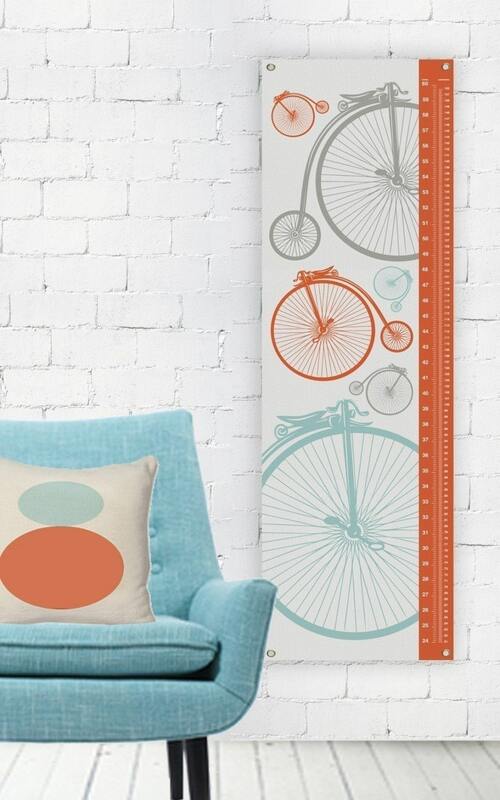 But the whimsy of the Vintage Bicycle is so sweet too! 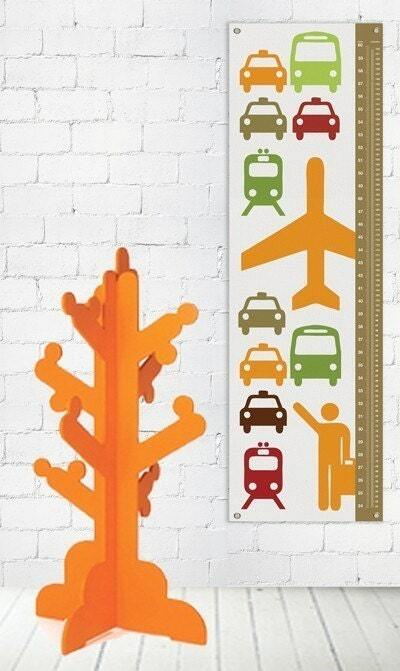 Giraffes & Stuff carries more than just growth charts. 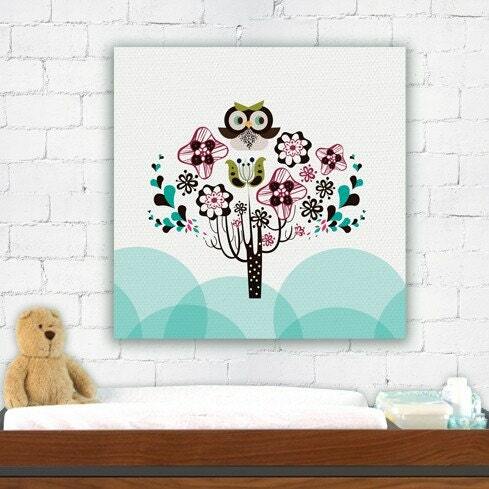 They have wonderful wall art, like the Air Adventures stretched canvas. And the sassy Hello Owl. 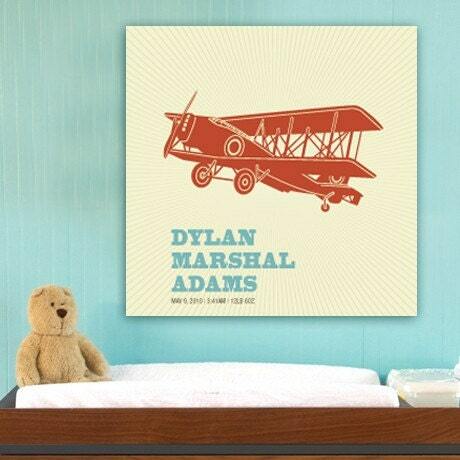 As well as reusable wall decals, like the Watch Me Grow set. 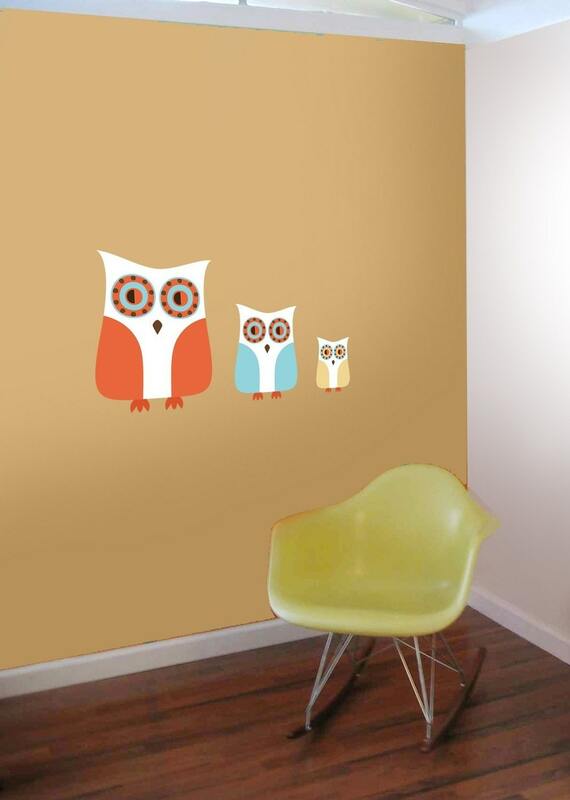 And the Three's Company Owls. If you're looking for unique and modern decor for your little one - or as a gift for someone else's - make Giraffes & Stuff your first stop. Just browsing around makes me want to redecorate! 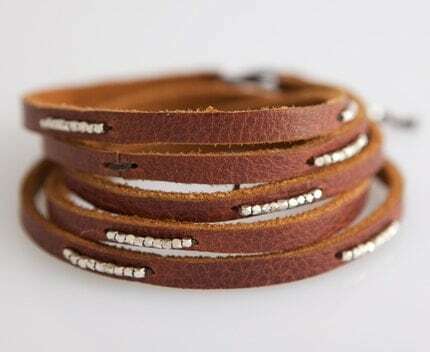 Visit Giraffes & Stuff and add the store to your favorites. Please leave a separate comment for each entry (two if you've blogged about the giveaway) and make sure to include a link to your tweet, blog post, etc. All entries must be posted on AFOMFT as a direct comment to this post. Comments on Facebook will not count as entries. This giveaway is open to residents of the U.S. and Canada and ends August 4th at 11:59 pm EST. The winner will be selected by random.org and announced on AFOMFT on August 5th. If the winner doesn't contact AFOMFT within 48 hours, a new drawing will be held so be sure to check back to see if you've won! Gabrielle and Alaina are turning two in less than two months so I am in full on party planning mode and I thought it would be fun to share a little bit of my inspiration for their birthday bash. More details on their party to come soon but if you have any fun ideas that you want to share, leave a comment. I'd love to hear them! Congratulations SHAWNA! You've won the Smart Gift Set from Mommy Genius, which includes one Bib Drying Rack and two Bumkin Superbibs. I know you're going to love it as much as I do! Please e-mail me at afomft@gmail.com by end of day Thursday, July 29th to claim your prize. If I do not hear from you by then, a new winner will be chosen. And a huge thank you to Mommy Genius for this fantastic giveaway! Don't forget to enter our other great giveaways we have going and use the exclusive AFOMFT discount codes. 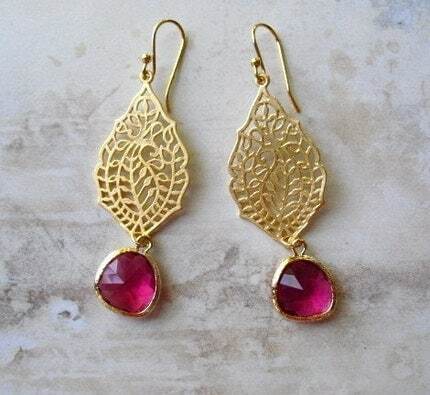 You can find them all on our GOODIES PAGE. Aren't those onesies adorable? You're probably calculating in your head how much it would cost to buy 12 of them just for the purpose of taking monthly birthday pictures. Not to worry! All you need is a set of milestone stickers from Sticky Bellies. Each month, stick one to a plain onesie, tee or other top and presto - you have the perfect way to record your baby's first year! This set is called "Sew Cute" because they appear to be sewn on appliques instead of stickers. And I love that the colors are gender neutral so you can give a pack of Sticky Bellies to an expectant mom even if she doesn't know what she's having. Sticky Bellies decals are just $15 for a set of 12 for baby (1-12 months). For photos this cute, that's one of the best bargains around! And at the Sticky Bellies online store, you can also buy adorable leggings like the ones above to go along with the stickers, as well as photo frames and brag books to show off your great shots. 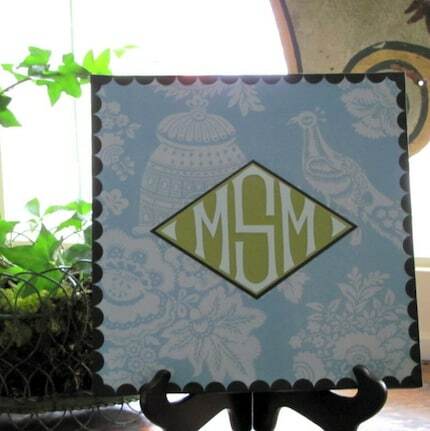 You've got all the makings for a fabulous shower or new baby gift all in one place. Talk about one-stop shopping! Please leave a separate comment for each entry (two if you've blogged about the giveaway) and make sure to include a link to your tweet, blog post, etc. All entries must be posted on AFOMFT as a direct comment to this post. Comments on Facebook will not count as entries. This giveaway is open to residents of the U.S. and Canada and ends August 2nd at 11:59 pm EST. The winner will be selected by random.org and announced on AFOMFT on August 3rd. If the winner doesn't contact AFOMFT within 48 hours, a new drawing will be held so be sure to check back to see if you've won!